Need Color, we’ve got your tarp. Orange, Yellow and Red tarps are in. Brighten up any space. Awesome for schools, playgrounds, pergolas and outdoor canopies. Not your style, we carry the basics too, silver, green, white and tan. All heavy duty, all 12 mil. Call for sizes and special orders. 951-2861. 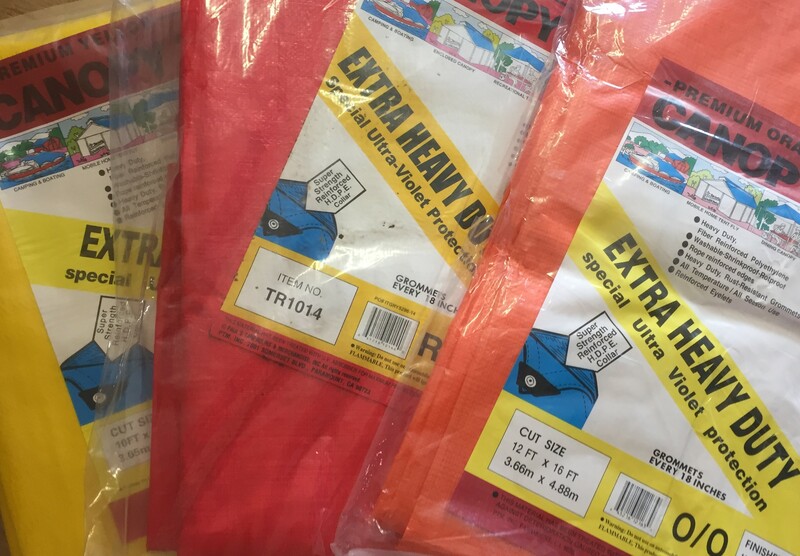 Orange, Red, Yellow Heavy Duty Tarps are perfect for applications where attracting attention is desired. Brightly colored tarps are excellent to signify danger, caution or simply accentuate an area. 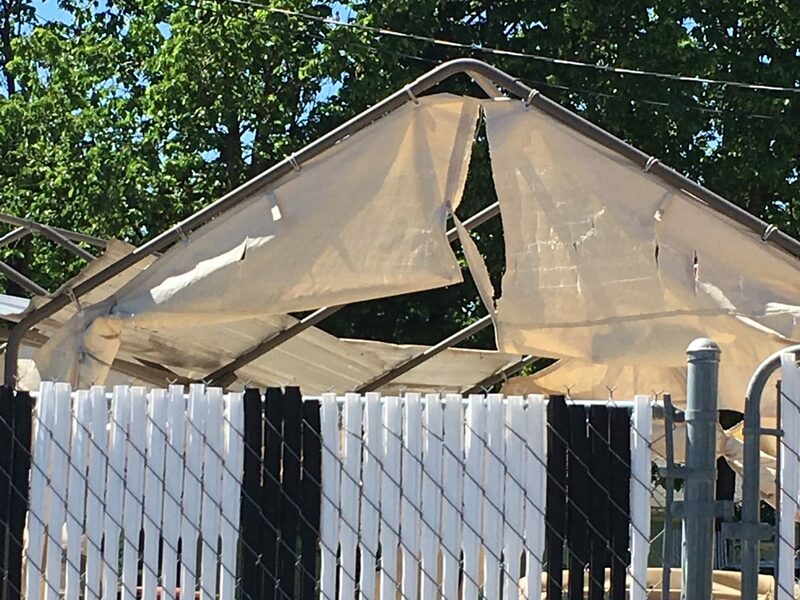 Find your heavy duty tarp needs at 1349 Redwood Ave. in Grants Pass, OR. Now featuring light depo and black out tarps. Check out our backyard greenhouses and custom frames. We carry frames from 10×10 to 16×100. Use them for cars, boats, livestock, camping or growing. We have more. See our large array of ball bungees, frame fittings and screen mesh. Make some shade. Triangle or square shade sails are colorful and create a cooling effect. Choose from evergreen, sea or sand in 12′ or 16′ sizes. Large shade cloth rolls for privacy, construction or shade come in 8’x50′ rolls. Don’t see it, we can order almost any size. Shade tarps are fully seamed and grommeted and block out 73% light. As a result, they are more durable and easier to attach securely. Furthermore, we stock 3 way corner and 4 way fittings in 1 5/8″ and 1 7/8″ inch for the do it yourself crowd. Simply need a replacement carport cover? We have them! 12 mil poly covers with a 12″ valance come in green, tan, silver, white and clear. Heavy duty 13 ounce vinyl is available in blue, gray, tan and white. Winter is around the corner. Need a tarp to protect your roof, we have 40×60 in stock. Also, we order sizes up to 120’x120′ and will ship to your home. Summer is not over. We stock 10’x10′ heavy duty pop-up shelters by Caravan. Fire retardant and built to last, these will keep off the heat and the rain. Need a gift, try our 100% cotton logo t-shirts and hats or a picnic tarp. Additionally, Cover your pumps, tractor, mower, pets or livestock with our smaller, made to order frames. Come see one today! We take orders. Place either by phone, internet or come in person. Almost everyone needs a tarp at one time or other. Rather than the thin blue variety, make a quality choice with Costless Tarps. Finally, if we don’t carry what you need, tell us. Because we want to keep you covered rain or shine. Stop by while visiting Grants Pass. 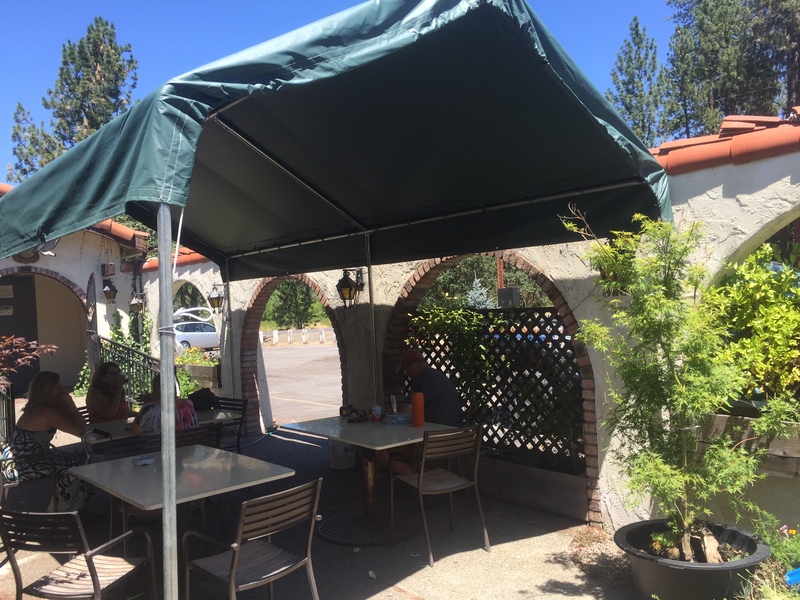 The tattered, worn canopy that shaded the outdoor area of the Moose has been upgraded. The new galvanized steel frame with a forest green vinyl cover provides ten additional feet of shade and rain protection. The 10’x20′ 1 5/8 inch steel frame is sturdy, attractive and can be fully enclosed to provide warmth in the Winter. The 13 ounce vinyl cover outlasts the lighter weight poly covers by up to 10 years and comes in several exciting colors. Canopy structures are used for anything from covering cars, livestock, people and equipment to providing shade and protection at events, commercial functions and parks. Contact us for non-profit discounts. Carport frames come in almost any size. They provide protection from the sun, rain and snow. Cover your pool pump. Create a 200 square foot storage space in 30 minutes. Don’t forget backyard parties, weddings and play areas. These make attractive, affordable event and shade tents. Leaving your car bake in the hot sun deteriorates paint and tires. Cover your vehicles, boats and equipment today. We have 10’x10′ canopies for tractors and mowers and 16×40 garages for cars, boats and motor homes. Not big enough, make it longer. Covers come in mid-weight poly to 13 ounce vinyl. Need a color to match your house? We’ve got tan, white, green, blue and gray. Give us a call, we’ve got you covered rain or shine. Let US put YOU in a carport today! Introducing the Stay Put Picnic Blanket. 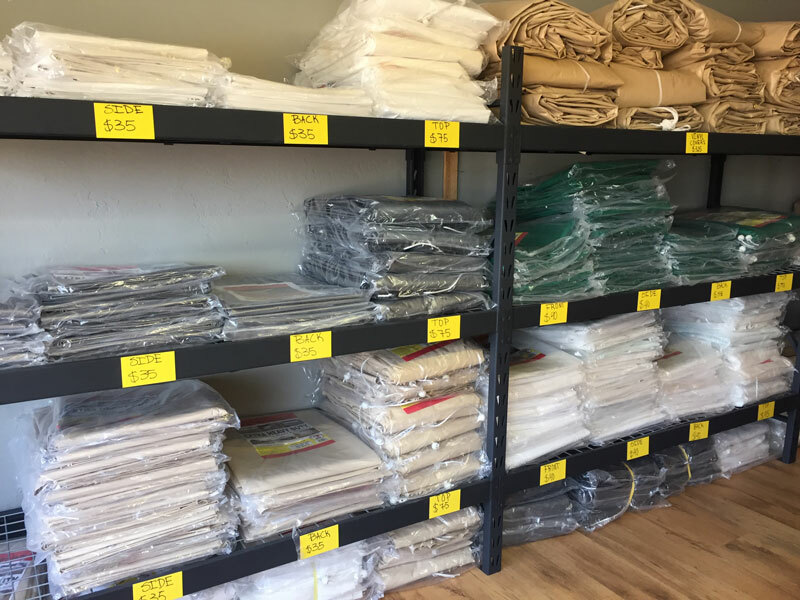 35 square feet of US made heavy duty cotton with stitched seams and brass grommets. Use tent stakes to keep you blanket from rolling, folding and wrinkling while you eat. 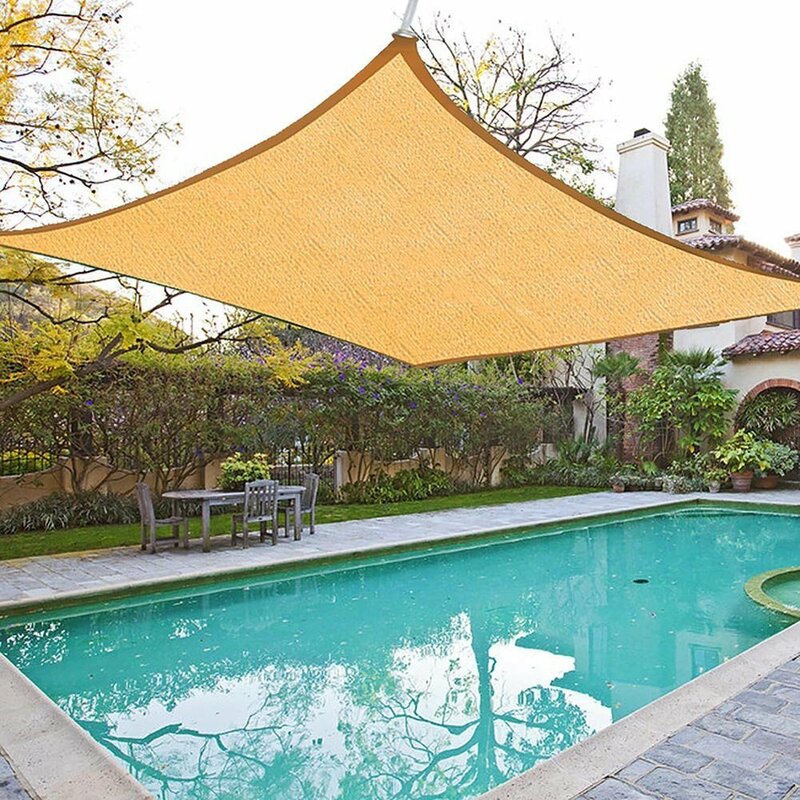 That’s not all folks, use the grommets and cord to make a quick shade cloth on Sunny Days. 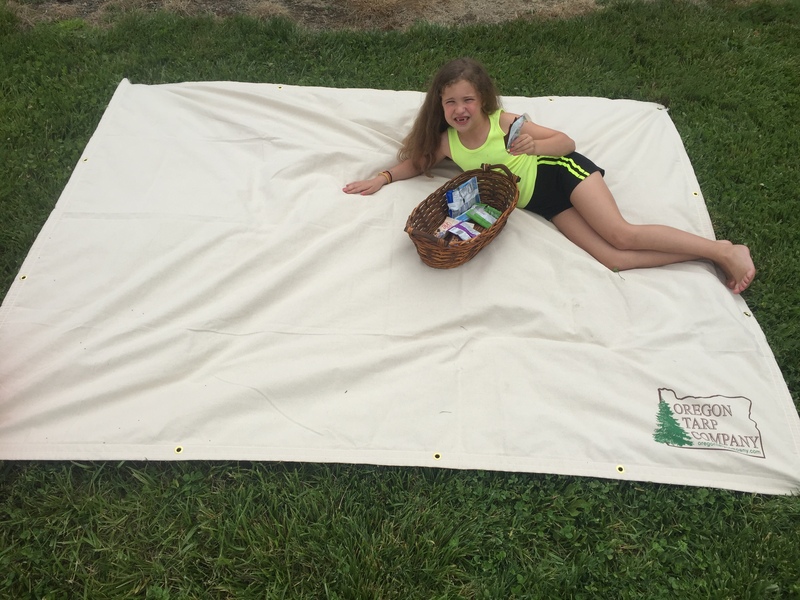 There’s more, the Stay Put Picnic Tarp makes great splat mats and play mats. Place them anywhere. And try this, lace cord through the grommets and you have a drag bag. Fill with linens, laundry, or soft stuff and drag it where needed. The Stay Put Picnic blanket is 100% cotton, machine washable and has the Oregon Tarp Company Label. We sell wholesale. Find our products at Costless Tarps in Gold Hill and Ashland Food Coop. Great for wineries, gift shops and delicacy food stores. Winter Left You In Tatters? WE’VE GOT YOU COVERED RAIN OR SHINE! Is your carport feeling exposed? Cover it up! A 10×20 frame outfit in poly is only 75.00. Dress it up with heavy duty vinyl for only 250.00 more. Have a dark brown snap Costco frame? No problem, our formal vinyl fits that size too. Let your frame be proud under our beautiful blue shade cloth with side curtains. Or show it off in our white 12 mil poly with valanced sides. Don’t be modest, dress up your frame. We’ve got something for every size and style. Check out our special discount for purchases of 300.00 or more. 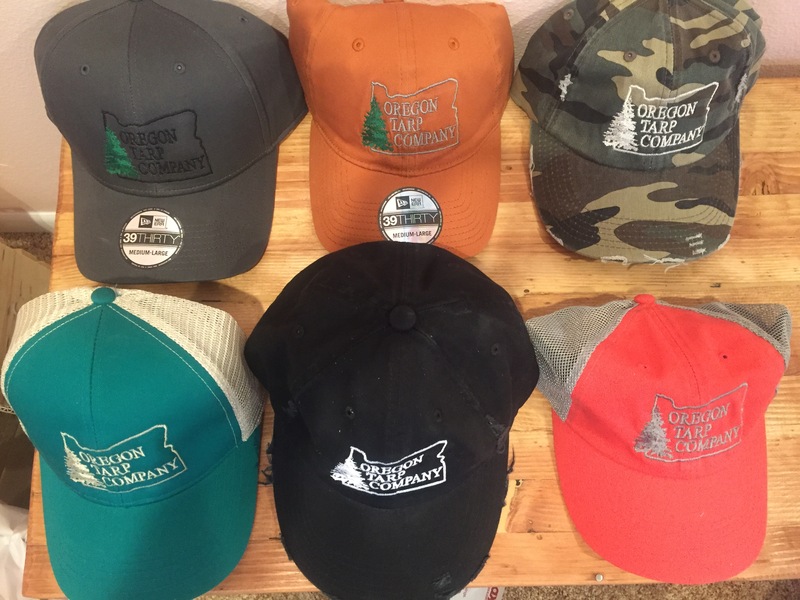 Get Your Collectible Oregon Tarp Company Hat Today! Quality, Attractive Hats keep the harsh Summer sun off your face. Be cool and stay cool in one of our OTP hats. Popping colors, camo or truckers hats, we’ve got one for everyone. Call us to order, only 25.00 each. Adjustable and fitted hats available. 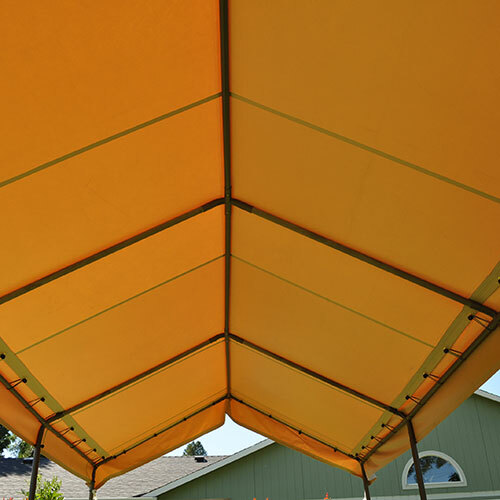 We carry hundreds of sizes of cooling shade tarps in a variety of colors. We ship right to your door. Create an instant cool, shady place in your yard today. Heavy duty and durable, our shade tarps will last year after year. Dress up your yard with black, green, blue or tan shade cloth. Fully seamed and grommeted our tarps are ready to use. Easy and fun to grow. Keep them healthy through the Winter in a Costless Tarps’ backyard greenhouse. Affordable and durable, greenhouses are great for storage and plant protection. 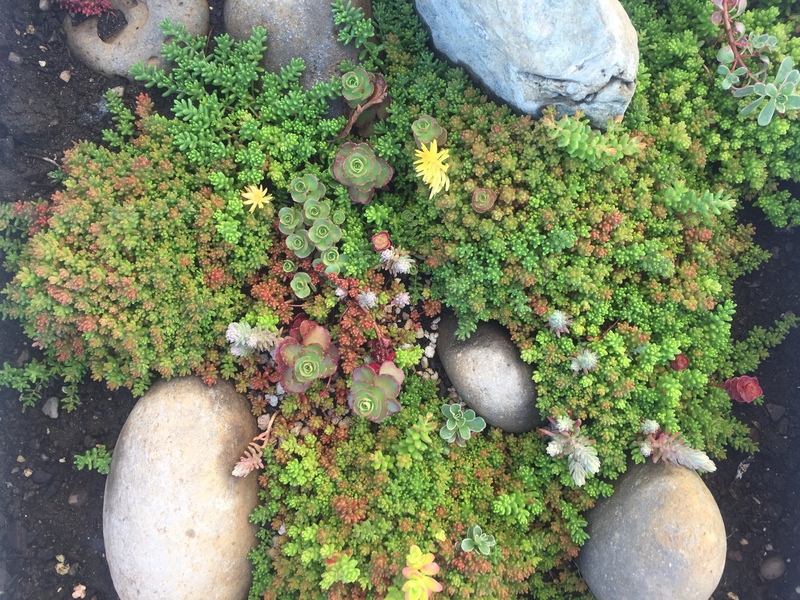 From Sedum to Haworthia, succulents prosper in greenhouses and outside. Our friendly staff will help you decide which greenhouse suits your needs. And visit our collection of succulents, they will make you smile. Stronger Vinyl Lasts Longer Upgrade From Your Poly Carport Cover To Heavy Duty Vinyl Just In, Oregon Tarp Company Heavy Duty Vinyl Carport Covers last 10-15 years. 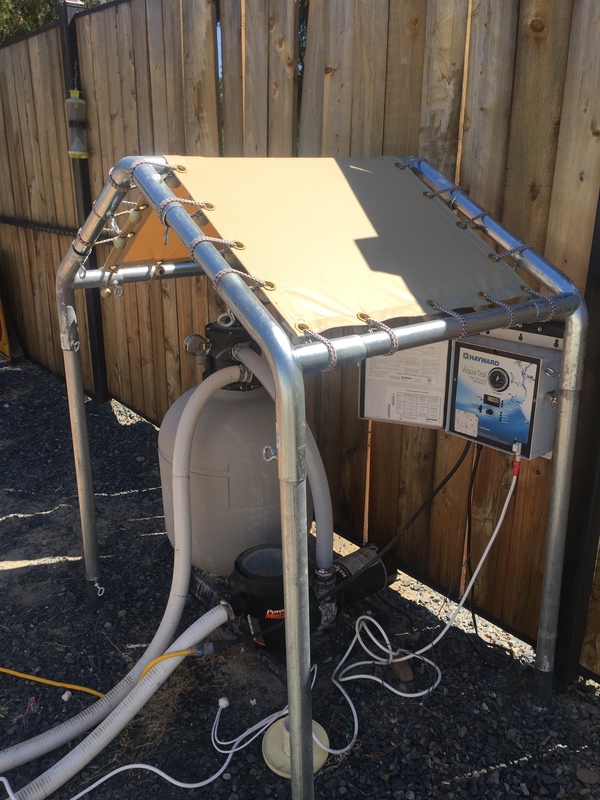 No more changing your plastic cover every few years. Vinyl covers are thick and heavy duty. And made in the USA. Each cover comes with the same detailing as the poly covers. 12″ flaps on the sides create a rain diverting valance. Interior seams connect to the frame using ball bungees. Hemmed rope in the front and back pulls tight to create a snug fit. Additionally, heavy duty vinyl covers come in a variety of attractive colors. Tan, blue, gray, white and forest green to name a few. Come check out our new covers at 255 Rogue River Hwy., Gold Hill OR.